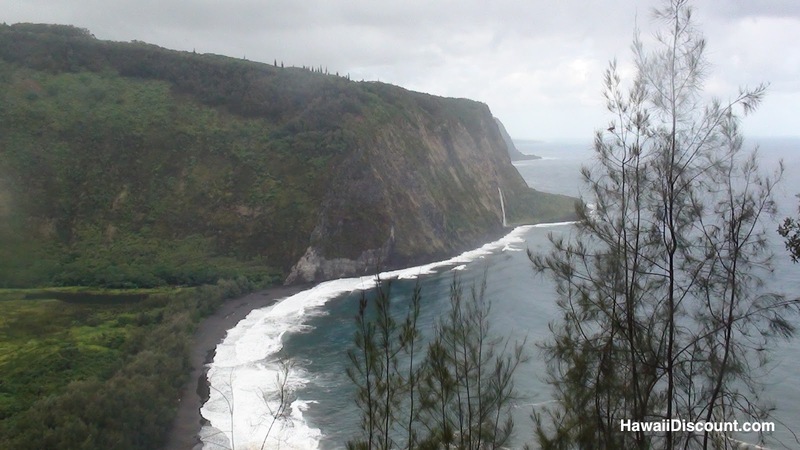 We recently had the opportunity to go on the Waipio Valley Horseback Ride on our most recent trip to the Big Island. 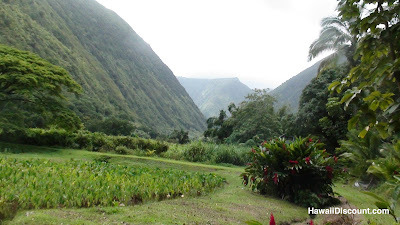 Na’alapa Stables took us on a rustic ride through the natural splendor of one of the most beautiful valleys in Hawaii. 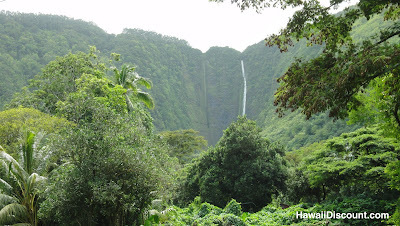 We thought the activity might be cancelled because of early morning rains, but that only served to decorate the entire valley with gushing waterfalls. At Na’alapa Stables, we met our guides and our horses and were on the way. As we trotted down the roads, wild coffee beans presented themselves as a sweet treat to anyone able to grab one as their horse passed under. Speaking of horses, mine was an eager steed named Waka. He didn’t like to go slow. Instead, he wanted to lead the pack. He definitely didn’t like to stand still. He would shake his head from side to side defiantly, as if to say “No, I don’t want to stand here, let’s get going!” There was one other horse that he didn’t really get along with well but I don’t remember his name. Our guide warned us not to let them get too close because they kick each other! Horses are a lot like people. At the halfway point, our group was presented with the option of crossing a stream, full with rainwater from the waterfalls all over the valley. The water wasn’t too deep, but our shoes might get wet. About half of us wanted to go, and half wanted to stay but the horses wanted to go, so guess what we did? We went. I could almost sense Waka’s excitement as he plunged headlong into the stream, which never was really that deep in the first place. Check it out in the video below! 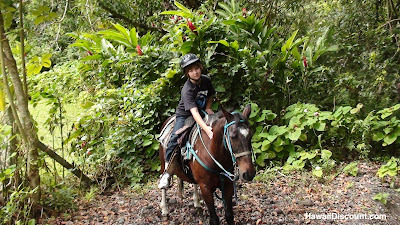 Out of the stream we headed back to the stables, once again passing a splendid view of green Waipio Valley, dappled with color from flowers and birds, the air filled with the sounds of the rushing waterfalls and a steady trot of the horses. What a way to see this marvelous place! 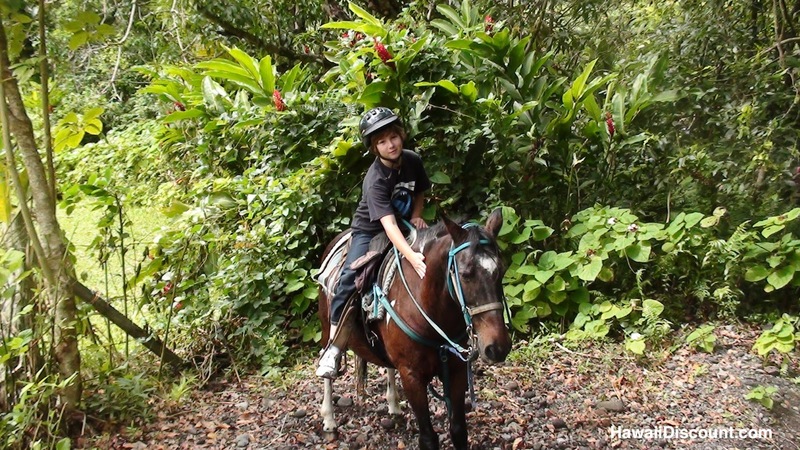 Reserve the Waipio Valley Horseback Ride with Hawaii Discount. Not only will you enjoy splendid views of Waipio Valley but the experienced guides take you through a lush tropical paradise of fresh water streams, jungle trails, tar fields, breathtaking waterfalls and scenic vistas. 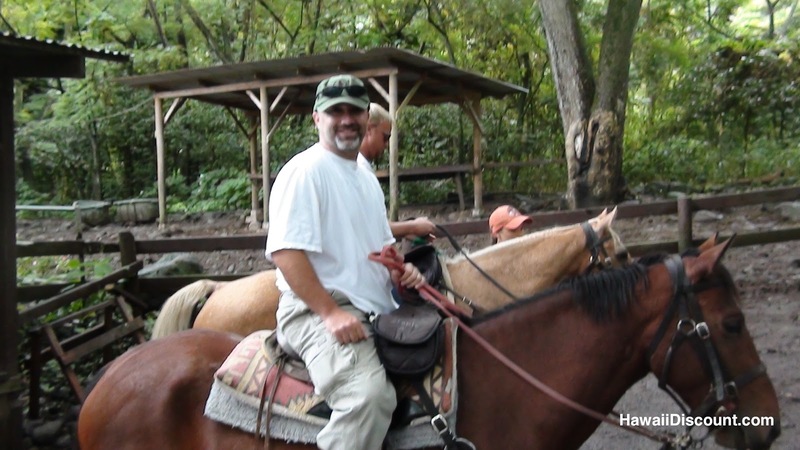 Where do you like to go Horseback Riding in Hawaii? This entry was posted in Big Island Tours and tagged Big Island, Hawaii, Horseback Riding, Na'alapa Stables, Waipio Valley. Bookmark the permalink.